This past Tuesday I went to the first lecture in the Orem City Library's Teen Summer Reading Program, You Are Here (there will be YA and children's author and illustrator lectures each Tuesday and Thursday for several weeks, check out the Library calendar or my Events Page for more info!). 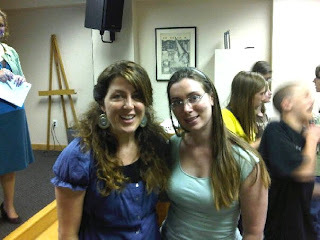 The lecture was given by LDS, young adult author, Kristen Chandler. I arrived early and passed the library's sale book section (oh how strategically positioned) and ended up buying three books, Janette Rallison's Just One Wish, Randall Wright's Silver Penny (both LDS authors), and Diane Duane's Wizard's Holiday (part of the Young Wizard series -published a decade or so before Harry Potter, people). I finally made my way down to the empty media auditorium where the lecture was to be held, sat in the front row, and continued to read Kristen's book, Wolves, Boys, and Other Things That Might Kill Me (and no, it is not about werewolves). A while later a few library workers came in to check on things and start setting up and I asked if I was allowed to be there (because I am not a teen or in their reading program) and I was assured that everyone is invited and welcome (so go, everyone! You are allowed even if you are not a teen! I highly recommend it). Then Kristen Chandler showed up to get ready. And can you believe it? She remembered me! I can't tell you how geekily happy this makes me when authors recognize me. In my mind they are like movie stars. 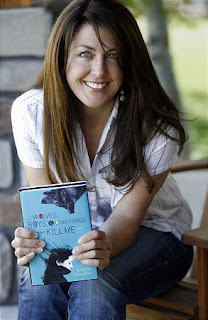 I had met Kristen at the Orem Barnes & Noble Authorpalooza last month and had chatted with her and the other authors near her about BYU classes and professors. I also had her book at the time so that's when I got her autograph. People started showing up soon after Kristen arrived and eventually the lecture and accompanying slide show presentation, entitled "Wolves, Boys, and Other Things That Have Taught Me About Being a Writer", began. Kristen Chandler lives in Orem, UT, is the mother of four, and loves to read (she is even an adjunct faculty member in the BYU English department!). As part of her presentation, she read the first chapter of her book (I love it when people read out loud). She then explained why she wrote Wolves, Boys & Other Things That Might Kill Me; after studying the wolves in Yellowstone National Park, she fell in love with them. Some people make wolves out to be horrible and others describe them as saintly, she said, but the wolves are neither. They are fascinating. Because of her new found interest, Kristen wanted to look into the different views people hold about the wolves. Thus her book was born. The main character, KJ, is a high school girl who lives with her dad in the small town of West End, Montana, near Yellowstone. Her dad is a tough-love type of parent and throughout the book she struggles with this as well as her her emerging young adulthood. Throw in an attractive young man and the controversy of the Yellowstone wolf re-introduction and you've got quite a story. The focus, of course, is the personal growth of KJ as she deals with the events in the story, but the factual information presented, which is the obvious product of some pretty in-depth research, is very intriguing. Did you know that the natural wolf population of Yellowstone was hunted and completely wiped out by 1926? After that, the whole ecosystem began to deteriorate, threatening flora and fauna alike. That's what happens when you take the "keystone predator" (thanks Wikipedia) out of the equation, everything gets out-of-whack. The situation became so bad that eventually, after much back and forth political stuff involving ranchers, biologists, and lawsuits, 66 wolves from Canada were released within the park in 1995 and 1996. Whew. Read Kristen's book to get a feel for what has become of the matter since. And just so you know, the wolf information in no way overwhelms the central story of KJ. Kristen said that recently, a young girl named Kelly Jean (The main character, KJ, is a Katherine Jean) from the real-life town that the town in the book is based on, wrote to Kristen and asked who she had based the main character on. Kristen assured Kelly Jean that it was not her or anyone in particular. Kristen also said that a woman from the town told her that she had gotten the teacher in the book just right. Go figure! When she was a little girl, Kristen loved to tell stories. She also had dyslexia, but because she read so much, the dyslexia went away (how do you say that? It became an un-problem. Can dyslexia go away? The demi-gods in the Percy Jackson series should follow young Kristen's example). Along with reading and telling stories, Kristen also loved being sporty and outdoorsy. Her parents had horses and there were always animals running through the house (probably not the horses). Kristen went on to college, traveled, got married, received a Master's Degree in Creative Writing, had kids, became a teacher -and was too busy to write! But she and her family eventually moved from Oregon (a misty and scary place that is like a fairyland, she said) back to Utah where in the winter of 2004 she had the idea for this book (according to Kristen, the secret to a good story idea involves the middle of the night and bad pizza). In the spring of 2005 Kristen went on her first wolf watching trip. She had 80 pages of the story written by the summer of 2006 when she met an editor who wanted more. Kristen wrote 200 pages in six weeks (holy cow!). Much to Kristen's dismay though, the editor finally responded in the spring of 2007 and wanted a major plot rewrite. Kristen informed her kids that summer was cancelled and she sat down to write. She said that it felt like rebuilding a house (I think she said that it was like having built a two-story house and then having someone tell you that you need to totally rebuild the bottom floor. Something like that). She resubmitted the story that summer and didn't receive a response until sometime after January 2008. She told us that during that time she was ready to give up. But! Suddenly two national publishing houses wanted her story and waged a big battle over it! That got settled and then she worked on rewriting and copy edits during the following fall and winter. Kristen gave us sage advice, "The wheels of time in publishing go chronologically." Do not make big charges on your credit card thinking that you will have a lot of money from being a soon-to-be-published author. You still need a job. Finally, in May of 2010, Wolves, Boys & Other Things That Might Kill Me was available in bookstores everywhere (I can only imagine what a huge and deep sigh of relief an author must give when they get to this point). During this time, Kristen was working on another book, Girls Don't Fly (I think it was originally called Taking Off The Chicken Suit or something like that), which comes out this fall (hooray!). Kristen explained that writing is a learning process and that rejections and revisions are a part of it. Each time you learn more for the time to come. She also said that she loves to meet people and hear their stories. She reminded us that everyone has a story (I love this concept. Aslan explains it very well in The Chronicles of Narnia). TERRITORY: Wolves have territory. So do writers. Know your territory -be a geek about something. Kristen wanted to be a geek about wolves, so she chased them (better than the other way around!). GO GET IT: Wolves go after what they want. Writers need to do this to. Don't compare your start to another person's finish. Don't worry. FOLLOW YOUR INSTINCTS: Write about what you love and fear most. Also, you don't have to listen to what everyone tells you. A writing group told Kristen to give up, but that made her try harder because she felt that her story was something special. DISCIPLINE MATTERS: Wolves have order. If they go against the order they will be killed (eaten?). Writers call this process. It is a very big commitment, but you need to come up with a process and stick with it. SEE: Wolves see everything, the broad down to the smallest detail. The cool thing about writing is that it helps you to see. There is a richness to your life when you live like that. Even if it's something bad, living life with that kind of energy is amazing. When you read a book that teaches you something, do you not notice that thing all day? SINGING YOUR OWN SONG IS FUN! Wolves each have a unique sound. Writers need this too in their writing. WE ALL NEED A PACK: Wolves need to be in a pack to survive. For writers this includes classes, writing groups, friends, conferences, blogs, books -any and all of these things. Concerning critique groups, don't be worried. You're all in the same boat. You'll receive criticism and then you'll get over it. Even if you're intimidated of joining a critique group, do it! Go out and be a part of that community. "One of the best things about writing is that it makes the world a more interesting place. Look at the world like a writer. Taste your life like you taste your food." At this point, we (the audience) were each given a piece of paper, a red pencil, and about five minutes to write about our worst school lunch experience ever. It took me a minute to think back that far, but I finally did and then it just came pouring out (it wasn't so much about lunch food as it was about being heartbroken during lunchtime. Oh, high school, the things you do to teenage girls). What is it called, a writing prompt? You should give this a shot! Then the lecture ended and Kristen opened the floor for questions. Q: Why do you write for teens? A: Because teens are brave. And they are terrified -but they aren't afraid to admit it. I fall in love with the voice of these characters. I want to live life that way, always, even if it's painful. Q: What is your new book (Girls Don't Fly) about? A: It takes place in Magna, UT near the Great Salt Lake. The main character is a girl form a large family. She is second in line (the second oldest). Her older sister goes to college, then comes home pregnant. The main character has to take care of everyone. Her boyfriend dumps her so she competes against him for a scholarship to go to the Galapagos Islands (such a big thing when I was in elementary school. Go JASON and Dr. Balard!). The focus of the story is the main character's evolution during the last six months of high school (it is such a good story that even on a bus, Kristen's editor laughed and cried while reading it). After the Q&A, we were able to get autographs and talk with Kristen. As I said, I had already gotten my book signed, but you know what? The Orem Library kindly provided copies of the newly released paperback edition for three dollars off. So I bought a copy and got it signed. It will be used at a later date (someday, when this blog has more followers...). Also, because she's so cool and because I didn't want to miss another opportunity to get a picture with her (I totally wussed out at the Authorpalooza. I had my camera, but didn't want to look like such a dork by whipping it out to take pictures of all of the authors. Afterwards, I could have kicked myself from regret. I hate regret! ), I pulled out my cell phone (forgot the camera of course) and asked one of the library workers if he'd take a picture of us -and wouldn't you know it! My battery was too low! So what did I do? I plowed on through and asked Kristen if she had a phone to use to take the picture (I later realized that this probably came across as very rude. But my mind was on one track -no regret). Kristen, being the great person she is (I know this now), didn't seem to mind at all (she was caught off-guard, I think, but she didn't act like it was inconvenient or a silly request). She went over to her purse, pulled out her phone, and gave it to the library worker. It was awesome. Then she sent the picture to Facebook so I could get it later. How cool is that? 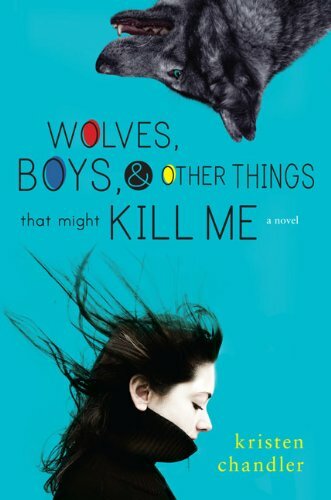 Wolves, Boys & Other Things That Might Kill Me is currently available in hardcover and paperback. Kristen's upcoming novel, Girls Don't Fly, will be released on October 13th of this year. Kristen is currently working on a new book as well as a sequel to Wolves. So excited to read more from her!